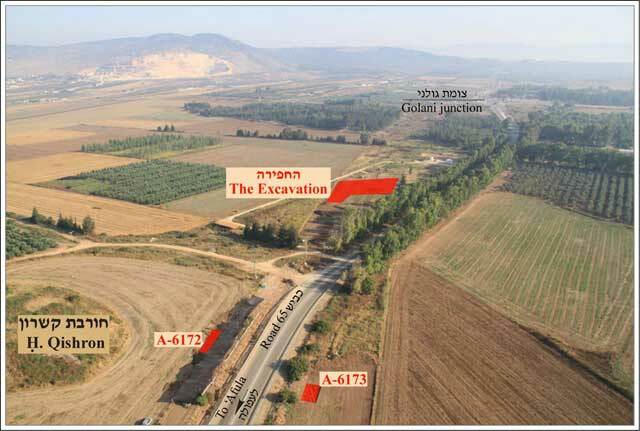 During May 2011, a trial excavation was conducted in an agricultural area north of Horbat Qishron, west of Highway 65 and c. 1 km south of Golani Junction (Permit No. A-6170; map ref. 23855–9/74136–8; Fig. 1), prior to expanding the road between the Golani Junction and ‘Afula. The excavation, undertaken on behalf of the Israel Antiquities Authority and underwritten by the National Roads Company, Ltd., was directed by E. Amos and R. Liran, with the assistance of Y. Ya‘aqobi (administration), A. Hajian and M. Kahan (surveying), W. Atrash (guidance) and laborers from Tiberias. The excavation was conducted c. 100 m north of a previous excavation along the eastern fringes of Horbat Qishron, where an inhabited region dating to the Intermediate Bronze Age was discovered and worn potsherds from the Roman and Byzantine periods were found (H. Smithline. 2002. An Intermediate Bronze Age Site at Horbat Qishron. In Z. Gal, ed. 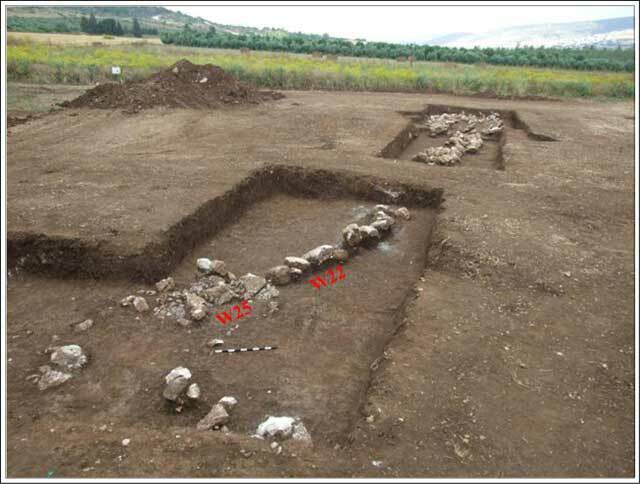 Eretz Zafon: Studies in Galilean Archaeology: *21–*46). Ten squares in six areas (A–F; Fig. 2) were opened in the current excavation (length c. 320 m, width c. 80 m). 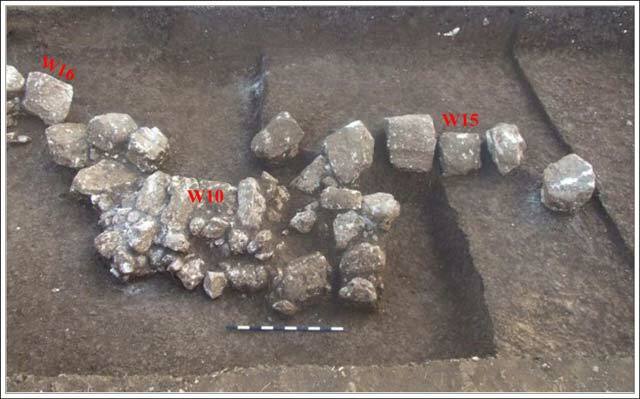 With the exception of Area B, where remains of a wall and building stones were exposed, no ancient finds were discovered in any of the other excavation areas. Area B (length 37 m, width 5 m) extends from east to west. Four wall segments (W10, W16, W17, W25; Figs. 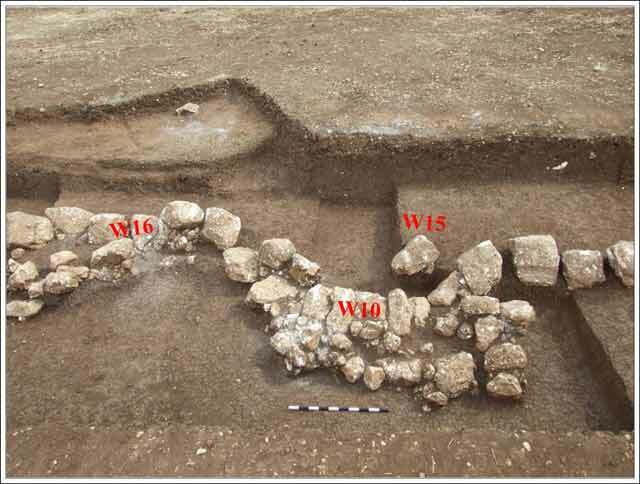 3, 4) and three rows of stones (W15, W22, W24) were exposed in a layer of clayey soil. The wall sections were built of large limestone with small fieldstones and gray mortar in-between (Figs. 5, 6). At least two courses could be discerned in Wall 10 (width c. 1 m; see Fig. 3: Section 2-2). It was also possible to discern two courses in a segment of Wall 16 (See Fig. 3: Section 1-1). The latter was probably the continuation of W10; it became detached from it and its courses were diverted to the north (Fig. 7). 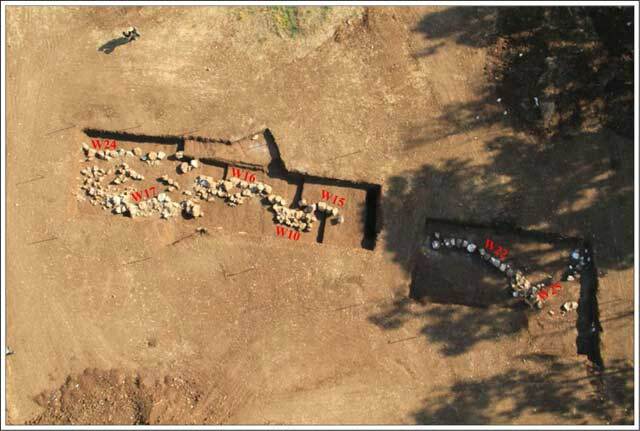 The three sections of Walls 10, 16 and 25 were oriented southeast-northwest, whereas Wall 17 was aligned northeast-southwest. The stone rows (15, 22 and 24; Figs. 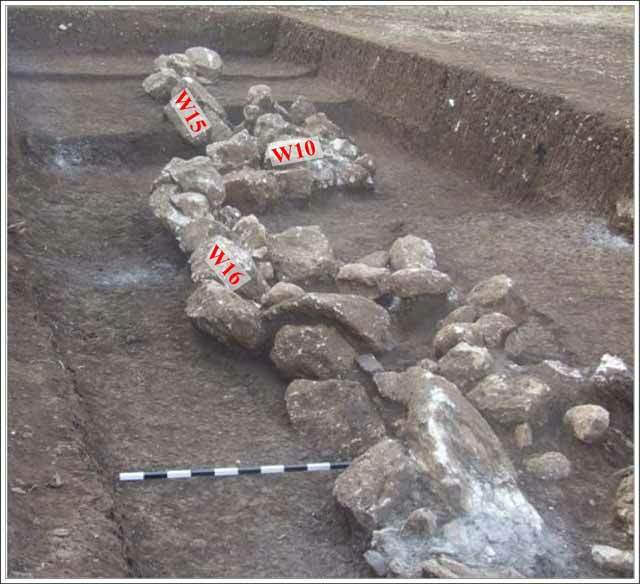 8, 9) were discovered curved, and included large dressed building stones made of nari. The stones, situated c. 8–10 cm apart, were all inclined at the same angle to the north (Fig. 10), similar to the section of W16. Several worn potsherds dating to the Roman period (third–fourth centuries CE) were found amongst the building stones and clayey soil. 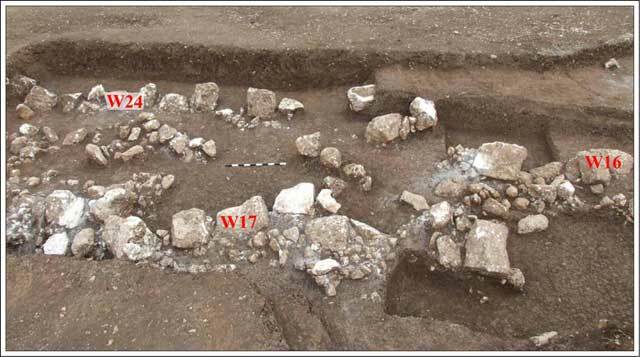 The remains are probably the foundation of a broad wall (or walls? ), which extended perpendicular to the gentle slope that descends from Horbat Qishron in the direction of the wadi to its north. The wall was probably used to delineate cultivation plots; it could have been connected to the water regime in the agricultural region of Horbat Qishron, or it may have been part of a structure whose nature will never be known. It seems that a detrimental event caused the destruction of the wall or even uprooted its foundations, because parts of the wall were scattered and possibly its lower courses were moved while bent violently in the direction of the slope. 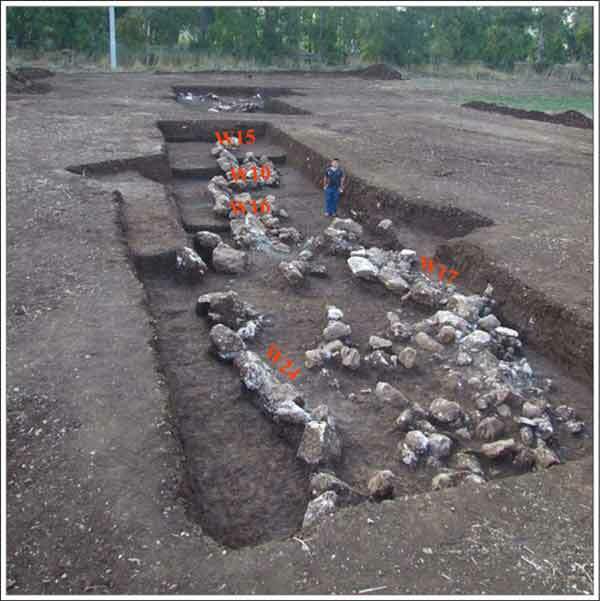 The rows of building stones were found curved in one direction, and the building stones were spread out at nearly equal intervals, all turned at the same angle and in the same direction to the north. The clayey soil that extended from the top of the wall to its bottom seems to suggest that this was not the original location of the wall, which was probably moved further north. It seems that the enormous force, causing the destruction of the wall and its uprooting, came from a single direction—the south, and from a higher place where the ruin is located, toward the slope. Such intense power could have been caused by a flood that flowed from south to north, toward the wadi, and swept with it the wall whose foundations were apparently not deep enough to withstand the strong current. The wall was probably washed away but did not lose its shape due to the moderate incline of the slope; if the slope was steeper the stones of the wall could have been scattered in all directions. 1. The excavation areas north and east of Horbat Qishron, aerial photograph, looking northwest. 2. 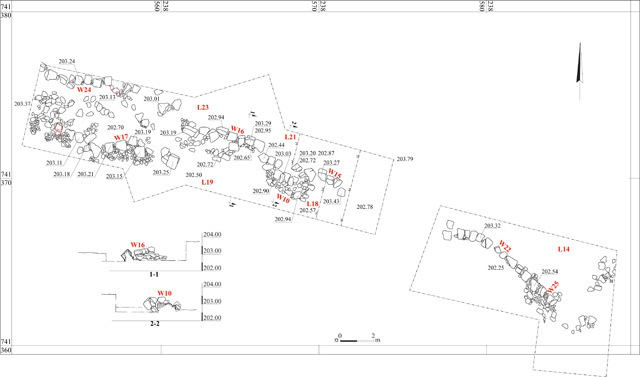 The excavation areas, plan. 3. Area B, plan and sections. 4. Area B, aerial photograph, looking north. 5. Walls 10, 15 and 16, looking north. 6. Walls 16, 17 and 24, looking northwest. 7. Walls 10, 15 and 16, looking east. 8. Walls 10 and 15, looking north. 9. Wall 22, looking west. 10. Walls 16 and 24, an upper course inclined northward, looking east.